Clearing skies, sunny periods. The weather forecast for the afternoon sounded promising, unlike the view of the steady rain out of my window. We went to Findhorn as planned anyway, hoping the forecast was correct. Arriving in the rain we shopped in the Phoenix Community Stores then had an excellent lunch in the Blue Angel café in the Findhorn Foundation village (a spicy Bombay potato pasty for me). The rain was still falling; a thin curtain of grey. We went down to the beach anyway to find the high tide just turned and the greenish sea fading into the clouds. There were no distant views. The swirling patterns in the sand, diving gannets, coloured pebbles, rock art on the sand dune slopes, the sound and sight of the waves thumping on the sand, the huge vastness of the merging sea and sky, the feeling of freedom and space, the possibility of anything – these were enough to hold the interest, at least for a while. 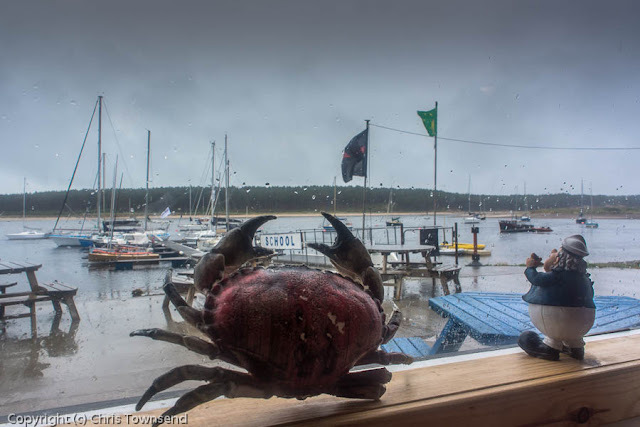 Damp and windswept we crossed the marram grass clad dunes to Findhorn Bay and another café, the Captain’s Table, from where we looked out on the rain and moored yachts. Was that a lightening in the sky; a sign of definition in the low, dark clouds? 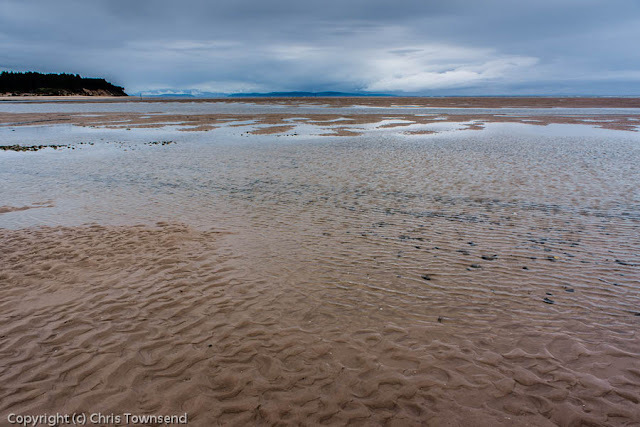 It was, just, and under a still overcast sky but with no rain falling we wandered round the bay and along the narrow inlet where the currents raced as the tide poured out into the ocean. 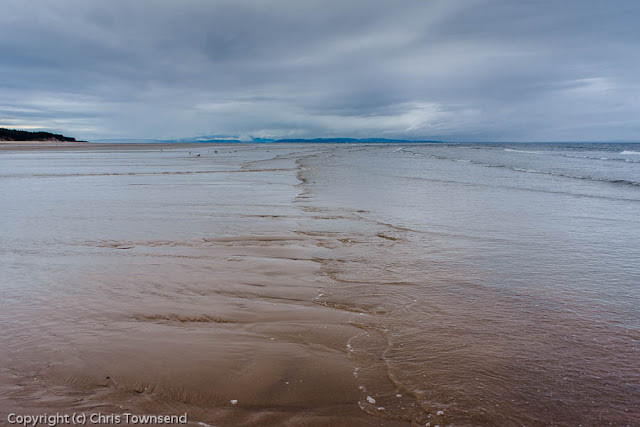 Big expanses of sand had appeared while we drank coffee and tea and ate shortbread and the waves were now distant from the dunes. Out on banks still surrounded by water seals lay on the sand, their mournful calls drifting over the water. Gazing at them I felt content. Despite the weather nature had worked its usual spell. Lovely!. Ten days on the Norfolk coast for me soon. Big skies, big space, and hopefully few people! !.